I first discussed the “turn-of-the-month effect” in Seasonal Insights issue 6 of March 21, 2018. The term describes the fact that price gains in the stock market tend to cluster around the turn of the month. By contrast, the rest of the time around the middle of the month is typically less profitable for investors. With respect to the US stock market, I also showed how the “turn-of-the-month effect”” evolved over time, when it was particularly pronounced and when it tended to wane. Does this effect have an impact on stock markets in other countries as well? I will examine this question in this issue of Seasonal Insights. First let us briefly recapitulate how the “turn-of-the-month effect” affects the US stock market. S&P 500 Index: gains are mainly generated around the turn of the month! Take a look at the following chart. 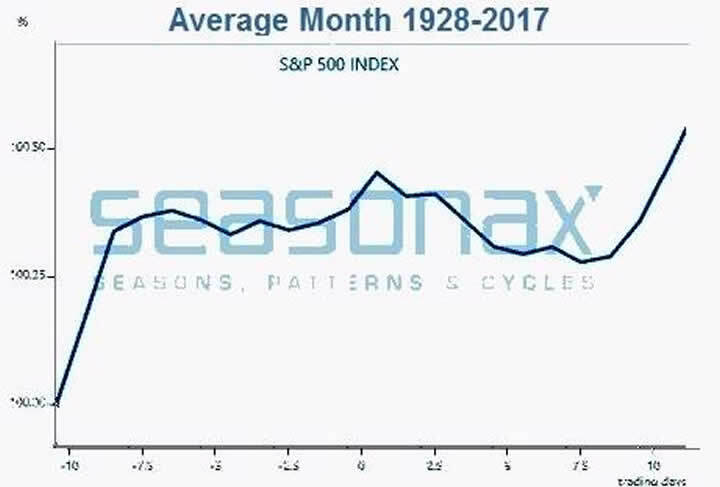 It shows the average pattern of the S&P 500 Index in the course of a calendar month since 1928. The horizontal axis shows the time of the month, the vertical axis the return of the seasonal index. In other words, in the middle of the chart we see the market's typical trend during the mid-month period, on the left hand side its trend right after the beginning of the month and on the right hand side its trend just ahead of the end of the month. The bulk of the stock market's gains are typically generated around the turn of the month. It is quite obvious that the market's gains are typically generated at the beginning of the month and shortly before it ends. In the remaining time period average returns were actually negative. This is the phenomenon described by the term “turn-of-the-month effect”. Does it exist in other countries as well? In order to answer this question, I have taken a look at the popular benchmark stock indexes of the eleven countries with the largest stock market capitalization from 1970 onward, or starting from the earliest year from which continuous price data are available. I have measured the average return of investing in these indexes in the time period from the 26th of each month to the 5th of the subsequent month, i.e., roughly over two weeks around the turn of the month. Then I compared this return with that achieved by investing in the remaining time around the middle of the month, i.e., from the 6th to the 25th of each month. Note: these timing parameters (5th/6th and 25th/26th) were chosen because they generated the best long term results in the US stock market. It is possible (even likely) that slightly different dates would generate better results in other countries. The following table shows the results for the major stock market indexes of all 11 countries, detailing the average returns achieved around the turn of the month and in the mid-month period. The returns generated in the turn-of-the-month period beat the mid-month period in all countries we have examined. The column designated “Diff” shows the excess return of the turn-of-the-month period over the mid-month period. As a glance at this column immediately makes clear, the gains achieved by investing in the turn-of-the-month period beat those of the mid-month period in all eleven countries, in most cases by quite a significant amount! 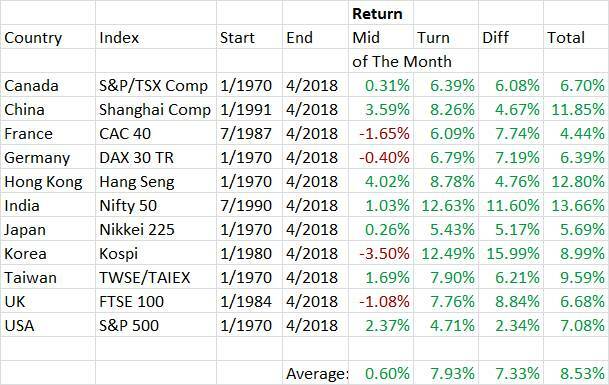 These excess returns are achieved despite the fact that the time period during which the turn-of-the-month effect occurs is actually slightly shorter. It is quite noteworthy that in all the other countries we reviewed, the effect was even more pronounced than in the US. In these countries it would actually have been advantageous not to have been invested at all in the time period around the middle of the month. As this table illustrates, the strength exhibited by the stock market around the turn of the month is a global phenomenon. This is a very simple pattern that has been known for a long time. There exist a great many more seasonal patterns, which can be identified with the Seasonax app on Bloomberg and/or Thomson-Reuters. Many of these patterns are still completely unknown. By contrast, many market participants have been aware of the “turn-of-the-month” effect for quite some time. It is interesting that it continues to work anyway. Apparently far too few investors have adapted to this recurring phenomenon and it seems to have attracted very little arbitrage activity. In order to examine more seasonal trends access our Seasonax app on your Bloomberg terminal by typing in “APPS SEASON”, or by selecting the App Studio from the Thomson Reuters EIKON menu. PS: With the Seasonax event tool you can create your own event studies! © 2018 Copyright Dimitri Speck - All Rights Reserved - Disclaimer: The above is a matter of opinion provided for general information purposes only and is not intended as investment advice. Information and analysis above are derived from sources and utilising methods believed to be reliable, but we cannot accept responsibility for any losses you may incur as a result of this analysis. Individuals should consult with their personal financial advisors.